Being Bitten by a Dog: How Safe Are You? Being bitten by a dog is a serious issue we all have dealt with at some time. Although this answer seems over-the-top, it is the truth. One of the most common behavior problems I deal with is play biting. If you have ever bought a puppy, then you may know this issue well. There are two types of bites that can happen; playful and aggressive. Playful bites can sometimes be just as damaging as an aggressive bite depending on the breed, the recipient, and the situation. 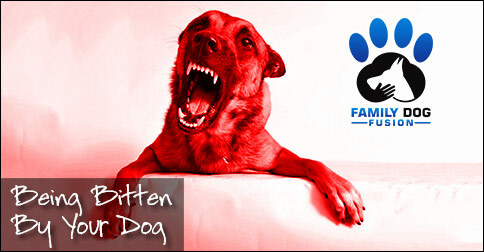 Fearful or reactive situations are most times when a dog will aggressively bite. Dominant issues are very rare and very difficult to correct. Play biting is a serious behavior that is best dealt with early in your dog’s life. What Exactly Caused THIS Dog Bite? Sometimes it is difficult to determine the reason the bite happened. This is where it would be very important to consult with a dog behaviorist. Even then, I have found that when faced with the possibility of getting rid of a dog, owners are not forthcoming with important information. Knowing the situation in as much detail as possible is the key for a dog behaviorist to really assess the issue. Sometimes it is necessary to meet the dog as well, but this is not always the case. Dogs have very few ways to communicate and the mouth is one of those ways. Making your dog know what is (and what is not) appropriate for her mouth is a very important aspect of family/dog communication. It is your responsibility as an owner to make the assumption your dog has no idea what the rules are in your home, and teach her those rules from the beginning. Many times, this is a mistake made by new dog owners, especially when adopting an older dog. How safe are you from being bitten by a dog? Not at all. The truth is, ALL of you have been bitten at one time or another, it is just the mean and aggressive bites that we really remember! Understanding the reason why you are being bitten by a dog will be the first step to rectifying the situation and making your dog an awesome member of the family.